Another exciting transfer was unveiled, that of Marija Jovanovic to Oltchim. With this, I am thrilled. Elisei-Jovanovic-Ozel-Vizitiu-Maier, all with very strong replacements and Aurelia Bradeanu to mend the defence. Graphic is classsy. News flashes right away; you see the next game is, as well as recent results, without having to click on anything. Then, the problems begin. They had the good idea of inserting CL statistics in players’ list, but did not care to update it. The Multimedia section is in fact a Pictures section. You get a Flash Player presentation of God knows what game, it doesn’t say. In the lower left corner, there is this tiny icon that takes you to the gallery. I think the initial plan was to put the most recent games on top, but they got confused along the way. The only 2010/2011 match gallery is on the last page. It is their first game in Moraca against Dinamo. Fine! And the sequal? It was equally thrilling! Where is the triumph against Viborg, where is the atmosphere by the spectators against Krim (once in a handball lifetime moment) and where is the celebration after the qualification in front of Oltchim? Future generations will wonder. What is great though, is the Maja Bulatovic album on the first page. There are pictures from her good bye game (those are always worth seeing), pictures of another era of Buducnost, pictures of young Maja Savic and Bojana Popovic. It is touching! Articles are up to date, but the pictures that go with them are of no use. You can’t see anything, because they are not in full size. This is annoying when you see the big empty space around them. Further on the page, they give the ehftv link (Oltchim! Take notice!) and the varvari.me link (priceless, if you want to understand what Buducnost is all about). This is a post I’ve been wanting to write for a while now. This season, reputed teams have been in search and need for goalkeepers. Let’s have a look at what is out there today. There is the fairy tale goalkeeper, the one you would not expect in “obscure” parts of Europe. With Katrine Lunde in Gyor, the Hungarians are now part of “the good world” of women’s handball. More than ever, getting big names seems to be a piece of cake for them. I am sure Katrine’s arrival upped the ante. Krim had a similar try with Cecilie Leganger in older days. On the contrary, Katrine is in total control of her goal space, with solid footwork. Her reaction is not as explosive, but she is a great athlete. Next, I will spoil you with the mother figure goalkeeper. Karin Mortensen would be more of a mean mommy, but with good reasons to be so. To prove the point, here are some images from the 2010 ECh, where she was the only constant player of the Danish team. The natural goalkeeper is the one that makes everything seem effortless. Katalin flexes her legs and arms, achieving more volume in her movements. To summarize, technique, spirit and talent would be the magical 3. Now, what about the heirs of these icons? The followers of Lunde and Leganger in the technique department would be Cecilia Grubbström and Anna Sedoykina. We see Mortensen- and Suslina- like spirit in Clara Woltering and Sandra Toft. Palinger and Ungureanu will leave their legacy to Jelena Grubisic and Amandine Leynaud, who have shown great talent. This one, is less about esthetics and more (much more) about information. News is not only up to date, but they are very documented. There is no need to search for it somewhere else, like on handball.hu. They always have interviews after any event, be it winning a trophee or signing a new player. They allow comments. I always enjoy reading this part because it gives me an ideea of how the club is perceived by the spectators. Their photo gallery is complete, but difficult to scroll through, you have to do it page by page. In the end, you’ll get used to it. They have pictures of all outside-the-court activities, like Team Buildings or parties. We first found out about those from Cristina Varzaru, remember? There is not much left to say, only that its simplicity breaths quality. And now, the best of the best. Itxako has the merit of having discovered Youtube and Facebook and that is what sets them apart from Gyor. Also, the appearence is more playful, but that’s a matter of “Who needs it?”. They have huge photo galleries on Facebook, which is the magic solution to easy browsing! Clara’s and Tereza’s fans should be happy. As far as Luca and Bese are concerned, there is no tragedy. Keeping 2 players for defence purposes only is a luxury that no team in the world should have. I prefer giving away several goals if it means we get to train our youngsters’ defence skills. Now, there was nothing spectacular in Oltchim’s reformation. The players leaving are those that they wouldn’t have used anyway. The players coming to Valcea … that is an intriguing story. Sanela Knezovic is brought to fill in for Paula Ungureanu. 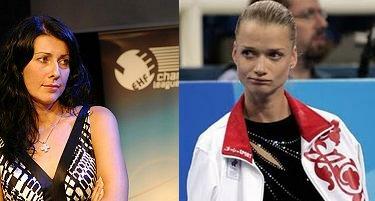 So, Tereza Tamas and Mihaela Smedescu (NT goalie) were not suitable. Logic says they are going to exit the NT circle for good. Voina says otherwise, he took Smedescu on the NT when she wasn’t even playing in ORV; he will hardly reconsider. It is for her very own good to be number one in any team of the league. Sanela was a bright choice and, probably, the only player who accepted the offer. Oltchim was after Grubisic and may have dreamed about Sedoykina/Sidorova for a moment. Aurelia Bradeanu is a complete player with tons of experience. Romanians have an emotional attachment to a player that brought them so many great moments of handball with the NT. They also respect her work in Gyor. Her coming was natural. Now, Soit, she will kick one RB out of the Valcea team, hence out of the NT. Voina will now have the perfect excuse for not putting Vizitiu out there, she will not have enough playing time. Sabotage. Linking this to the Neagu story, it seems a given that we are in for another scandal next year, followed by a break-up, followed by an international signing, followed by Voina’s bitter words.